I find it funny that the film that would alter Basil Rathbone’s career and type cast him forever is a film he is barely in and lists third in credits. 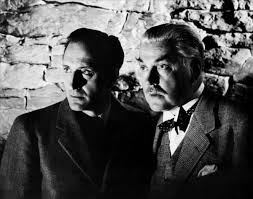 A reasonably faithful adaption of the Conan Doyle story, Rathbone’s Holmes is off screen for much of the film as Watson and top billed Richard Greene wander the moors. A griping dark and stormy night flick this is a super film that rightly spawned a series. I find it odd that after one more film(The Adventures…) Fox would let the series and its stars go where it would spin out for twelve more films before Rathbone walked away saying enough. I guess they couldn’t see what they had.